To celebrate the partnership between Casio watches and Red Bull Racing, Casio have released the Edifice EFR-520RB limited edition watch. The EFR-520RB is the latest in the Edifice line of the steel bracelet watches from Casio which was based on the EFR-520, only this special edition comes with the Red Bull Racing logo on the dial and the team colours accented throughout. Along with all of the other Edifice watches, the aim was to combine "speed and Intelligence" to fit in with the motorsports theme surrounding the range. The watch has a silver tone stainless steel bracelet, a black bezel and matching black top crown. It also features tachymeter and chronograph function, displayed on the three smaller dials on the watch face. Along with the features and the use of the red, yellow, blue and white, the watch has a real look which fits the motorsport style, which gives a more expensive look than the humble price-tag actually displays. Along with the watch and the display box, each watch from the limited edition comes with a watch stand and photos of the Red Bull Racing team and shots of the cars that they drive. The watch was launched by F1 Red Bull Racing driver Mark Webber in Monaco, just ahead of the Monaco Grand Prix in May 2012. Webber has been an ambassador for Casio watches and worn Edifice for several years now, including the last 2 years where he finished 3rd in the world championship title race. 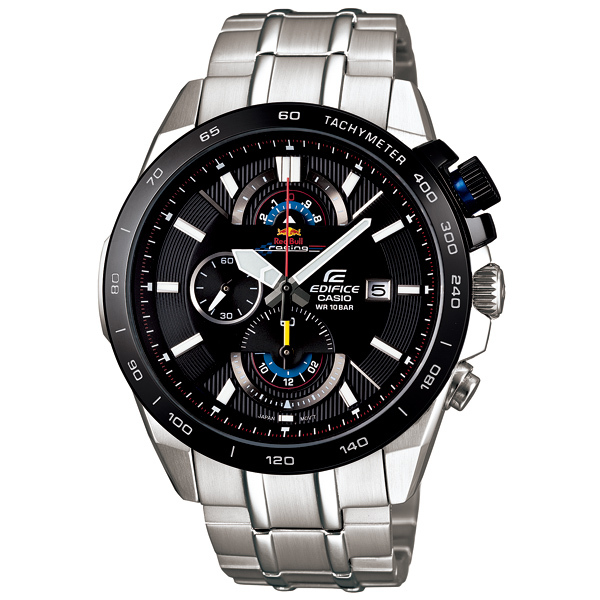 Overall, The Edifice EFR-520RB gives the look of a high end sports watch, the style offered by the chronograph function and the prestige given by the Red Bull Racing logo creates a finish that can rival many of the motorsports associated timepieces, but with the added bonus of it coming at a fraction of the price. Functions: Hour, Minute, Second, Date, Tachymeter.